When new wooden printing blocks arrive, I usually cannot resist adding one or more of the designs to my own personal collection. This piece is a result of my jumping to try out WB110 Leaves and Stem, a nicely sized and detailed rectangular block in a variety of colors. 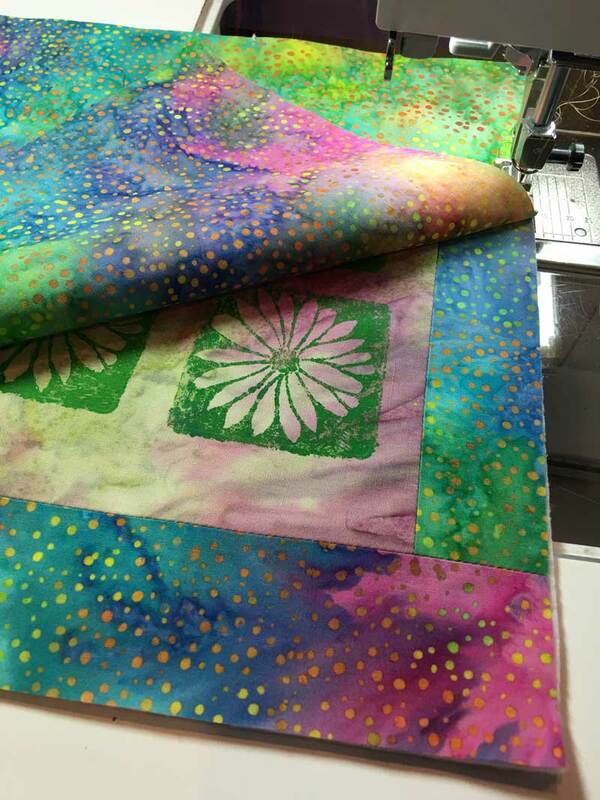 Digging through my bin that stores my printed swatches, I found one of the Leaves and Stems prints and paired it with another print, a 4-up grid of WB344 Daisy Square Flower on a pink/green batik. Both had been printed with green textile paint and I knew I had the perfect complement in my stash: I chose a bright batik to sew these together with sashing and borders. There are several names for the technique I used to complete this quilt together: pillow case construction, escape hatch, knife edge: you end up with a traditional 3 layer quilt with no binding. Very easy to, and it creates a nice finish (here’s one explanation). Cut a slit very carefully in the back fabric and pull the right side out. Once the quilt had been turned inside out and was pressed and ready for quilting, my next experiment was to try a heavier thread for my free motion quilting. This is more toward the 12 weight on the flowers and leaves. I carried the leaf motif down the side to join the flowers and the leaves. Finished: one more quick quilt-let! I love the leaf stamp and look forward to using it again. I’m Teaching Block Printing for The Fiber Art Connection! As noted in our latest enewsletter, registration is now open for Session 2 of The Fiber Art Connection, with classes beginning September 1. 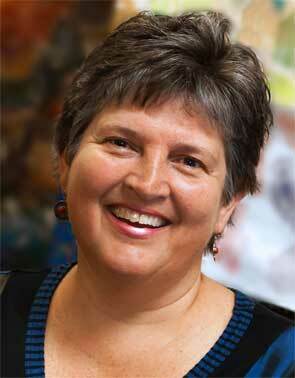 Each of the six lesson is a two week long artist immersion, for a total 12 weeks as well as a bonus week. The Fiber Art Connection is a fully-interactive online class platform that allows teachers and students to connect: participate in live calls and webinars as well as a private Facebook community and message boards. If you are unable to attend the live calls or webinars, no worries: everything is recorded, and will be accessible to registrants indefinitely. Desiree Habicht, Lesson 1, Old World Tiles: a wonderful introduction to using Acrylic inks on fabric that adds painting techniques, inks, netting and threads to create the look of old world tiles. 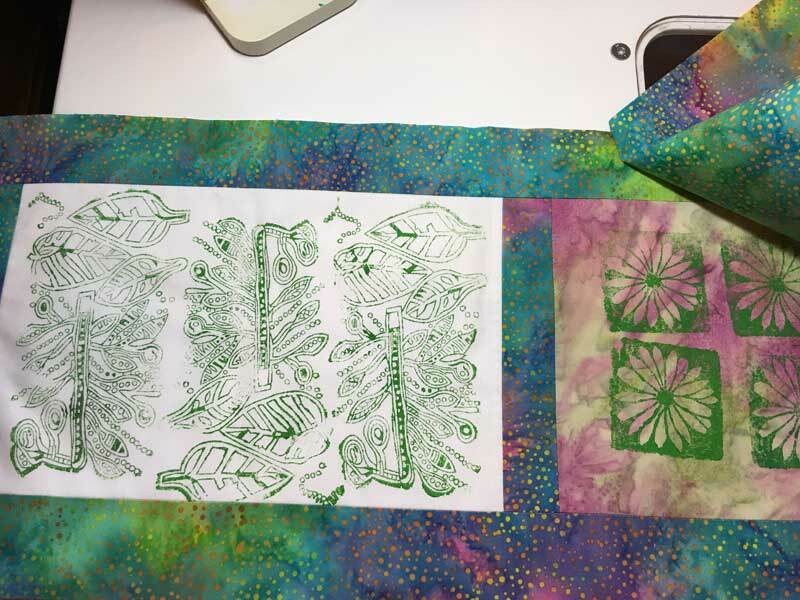 Lisa Chin, Lesson 3, Create your own Stamps for Fabric Design: learn how to carve rubber stamps using your own drawings (or copyright- free images) to customize hand dyed or commercial fabric. 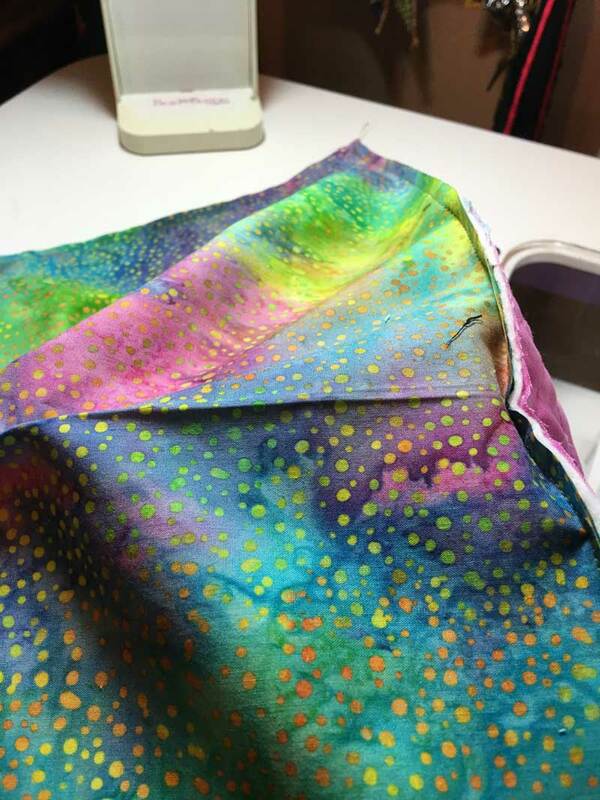 You will learn how to carve words and patterns and how layer stamps as well as discuss the best paints, inks and stamp pads to use on fabric. Libby Williamson, Lesson 4, Stitch-Paint-Whimsy: enjoy two weeks of creative fun as Libby guides you through her free-motion stitching techniques, combing cloth and paper fibers and assorted mark-making techniques to create textural, brightly colored art. 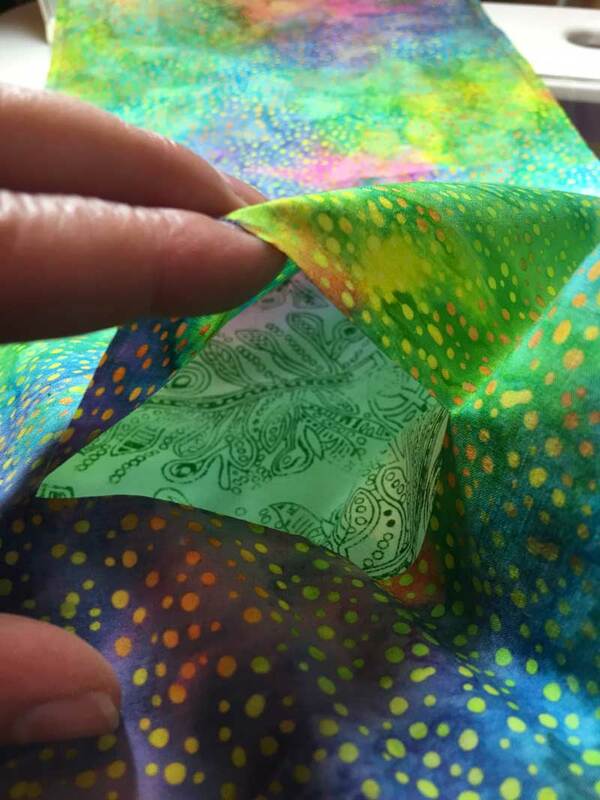 Suzanne Connors, Lesson 5,Introduction to Eco-Printing: experience the magic and surprise of color that can be achieved with Eco-Printing (using plants to dye and print on fiber through contact printing methods). Learn how to choose and prepare plants for dyeing; to understand the print process on protein fibers; different techniques of folding, tying fabric, shibori and other types of resist as well as methods of constructing and cooking bundles. 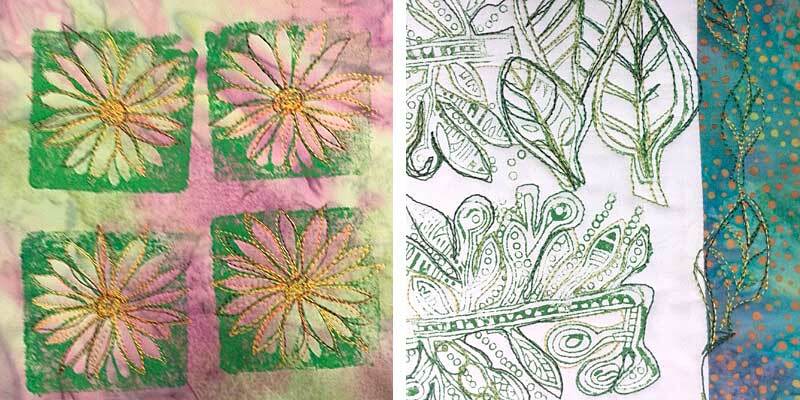 Judy Gula, Lesson 6, Wooden Block Printing and More: learn to lock print on textiles using hand-carved wooden printing blocks. You will explore several different surface design techniques that will give each of your blocks a hand stamped or designed look. The bonus week will be filled with projects, ideas, and helpful hints on a variety of topics. It is also an opportunity for you to submit your big questions at anytime during the week to any of the artists for an answer, as well as a closing celebration of all that was accomplished during the Session; to show off the projects that were made in class.